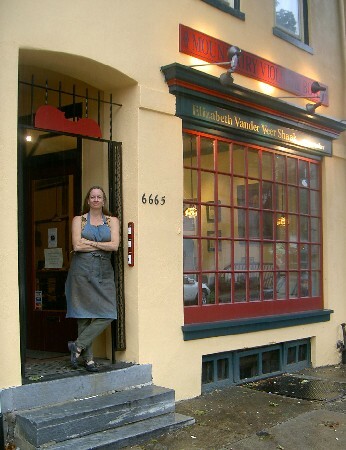 Bowmaker Elizabeth Vander Veer Shaak outside her shop at 6665 Germantown Avenue that has a new façade. Aside from Elizabeth Vander Veer Shaak’s custom-made bows, Mount Airy Violins and Bows highlights the fine works of other modern bowmakers (see Bows For Sale), offers affordable violins (Violins for Sale), discount accessories, and features CDS of local string musicians. With almost 20 years of experience and original training in Paris, Brussels and New York, Elizabeth uses precious materials while giving consideration to design, tone and playablility to create a “one-of-a-kind” bow to be enjoyed for generations. She draws on her research of master bow graduations to create bows that have a specific feel from a particular period of time. She enjoys partnering with players when they commission a bow by listening, understanding the player’s approach to the instrument and allowing the player to sculpt his or her sound. Her bows have been enjoyed by a wide variety of musicians: the classical soloist, Christian Tetzloff; the innovative jazz musician, John Blake, and the compelling old time musicians, Bruce Molsky and Rafe Stefanini. General vicinity; street level (You can input your origination address in the fields under the map. Mt. Airy/Chestnut Hill, outlining communities and the suburbs.